Summer is on the horizon and inevitably there will be events in which a dish to pass will be required. I, admittedly, am not so adept at pasta salad. I can whip one up but they usually bore me. Some people are just better at it than others I've decided. Maybe I'm missing the pasta salad gene. Guess what, I don't care because last night I tried a new (non pasta) salad that is a perfect dish to pass. So, I thought I'd share. As usual, it came out of my Food TV Magazine. 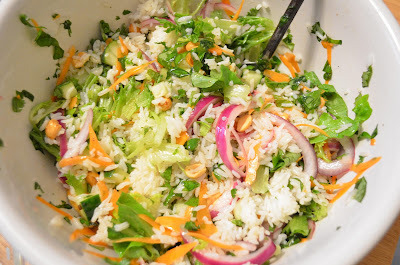 It's called Lemon-Herb Rice Salad. Now, there is only one thing I didn't love and that was the use of mint. Many recipes call for mint and I stay away from them. I just don't care for it. I was brave though and I made it as directed. Next time, I'm leaving out the mint. You do whatever makes you happy. While you cook up two cups of long-grain white rice as directed on the bag, you put a 1/4 cup of vegetable oil and a large piece of lemon rind on the stove over medium heat. 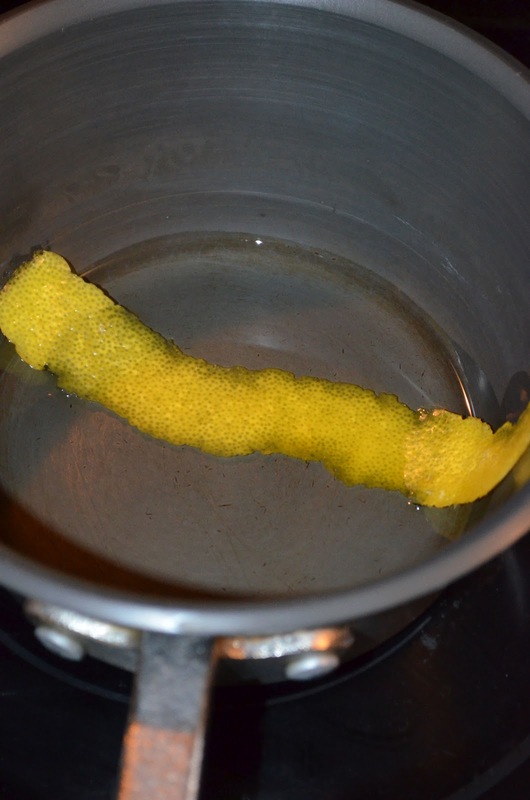 You're making lemon oil! Cool, right? It takes about 5 min then let it cool. While that's working you slice up some red onion and make a dressing of lemon juice, rice vinegar, light brown sugar, salt and pepper. Then add the lemon oil and whisk it together. You let the onions marinate in the dressing for 15 min (just about enough time to cool the rice to room temp). 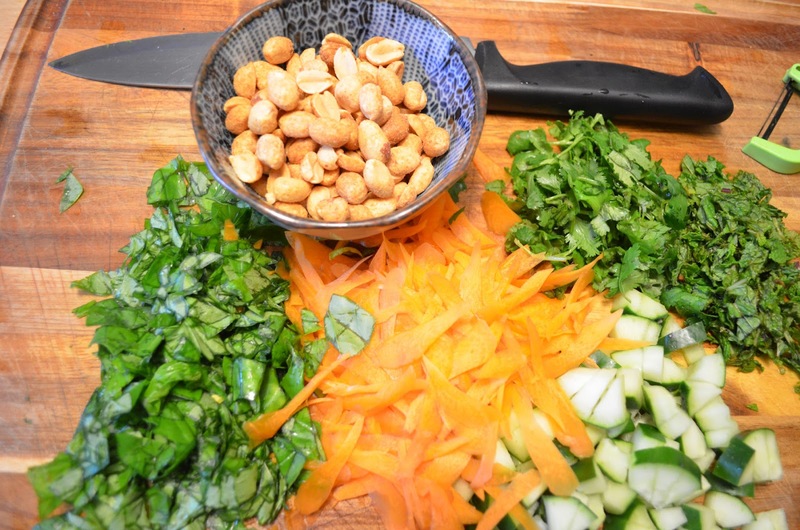 While things are marinating and cooling and such, you can chop up some cucumber, shred a carrot, and roughly chop some fresh basil, cilantro and mint. Also a good time to wash off your greens if needed. The recipe calls for watercress but we used some baby lettuce mix that we had on hand. Then you toss it all together with the dressing and wa-la! A really great summer salad. This will go perfectly with any cookout menu. 1 bunch of watercress, tough stems removed, leaves torn (any baby lettuce will work if you cant find watercress). Remove 2 wide strips of zest from 1 lemon with a vegetable peeler. Combine 1 strip with the vegetable oil in a small saucepan over medium heat and cook until the edges of the zest turn slightly golden, about 5 min. Let lemon oil cool. Meanwhile, cook the rice as label directs, adding the other strip of zest to the water. Transfer cooked rice to a large bowl, discarding zest, and fluff with a fork. Let cool to room temp. Meanwhile, make the dressing: Juice both lemons into a med bowl. Add the vinegar, brown sugar, 1 1/4 tsp salt and 1/2 tsp pepper and whisk until the sugar dissolves. Discard zest from lemon oil, then whisk oil into the dressing. 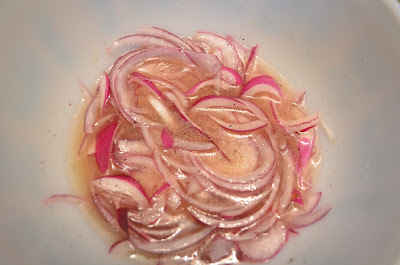 Add onion slices and let marinate 15 min. Add carrot, cucumber, peanuts, cilantro, mint, basil and watercress to the bowl of rice. Add the dressing mixture and gently toss. 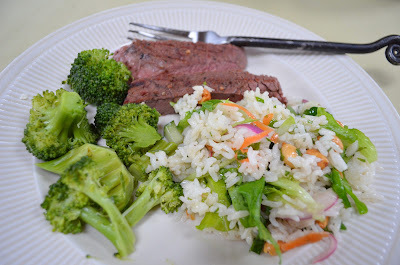 We had it along side some grilled steak and steamed broccoli. This recipe is going to get some serious use this summer, I hope you like it as much as I do!